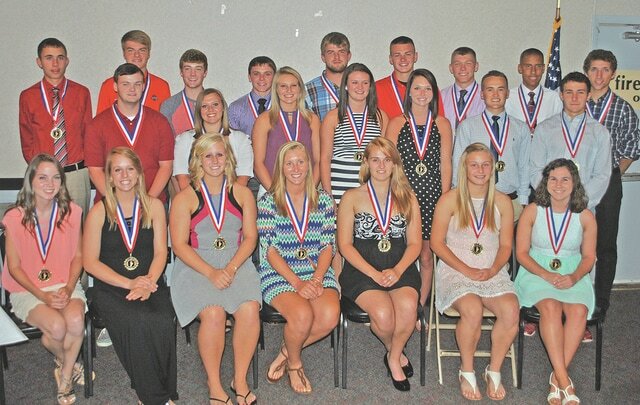 The Times-Gazette honored 33 senior graduates Wednesday who were nominated by their coaches for the 2015 Highland County Scholar-Athlete Award. Pictured above are the 23 scholar-athletes who were able to attend the banquet, where four new members of the Highland County Athletic Hall of Fame were also inducted. The award co-winners were Trey Moberly of Hillsboro and Kiley Sosby of Whiteoak. Those nominated included: Kaylee Achor, Austin Bagshaw, Sydney Barton, Zack Basford, Kaylynn Bell, Brittney Brown, R.J. Collard, Sydney Cromer, Kaitlin Evans, Ryan Faulconer, Tommy Free, Alison Goolsby, Michael Gunderman, Erin Hagan, Wyatt Jones, Shania Massie, Moberly, Rachel Onusko, Ashley Purtee, Trista Rhodes, Alexis Sears, Aaron Sharp, Kaylee Smith, Sosby, Cameron Spangler, De-Andre Steward, Ali Stratton, Gabriel Tamborski, Sarah Thompson, Alex Van Zant, Maverick Ward, Toby Warrington and Taylor Wheaton. For more coverage from the banquet, see Friday’s Times-Gazette.